We are thrilled to announce today that as AIA Dallas and the Foundation plan their move to a new home downtown, the Dallas Center for Architecture is entering this new era as AD EX, The Architecture and Design Exchange. With the completion of our facilities in the architecturally iconic Republic Center this October, AD EX aims to be both the physical place and an even more engaging mechanism for spurring conversation about walkability, mobility, historic preservation, affordable housing, economic development, and other civic challenges related to architecture and urban design that impact the city. 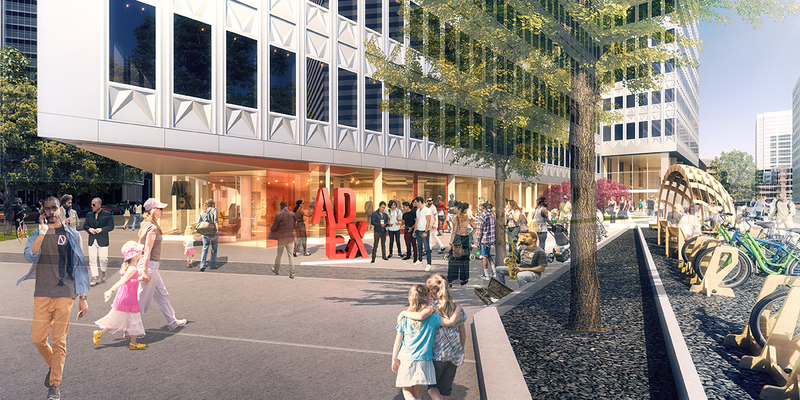 AD EX’s street-level location in the dense urban core of Dallas and adjacency to downtown’s next planned public park, Pacific Plaza, intends to break down barriers and facilitate the informal exchange of ideas about design and architecture. 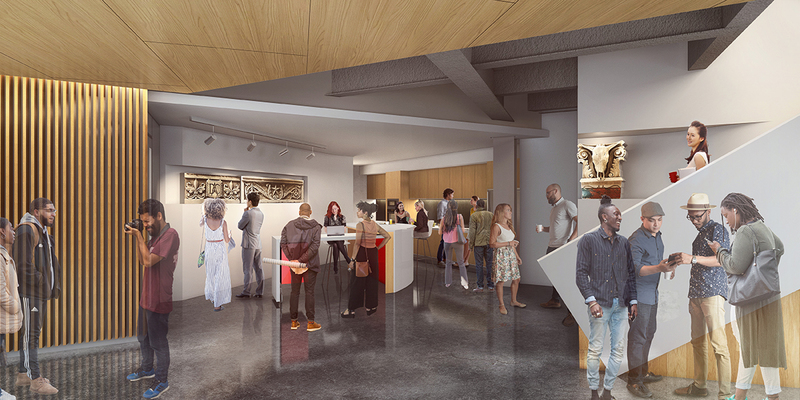 Its interior space, outside terrace, open floor plan, and floor-to-ceiling windows will showcase design-focused exhibitions, films, book and panel discussions, student workshops, policy symposia, and other programming. An outdoor terrace will bring our programming outside of the walls of the AD EX. Sculptural branding defines the space and invites the public in. There is ample space for pop-up programming being planned in consultation with Better Block and a variety of community partners. The interior space is transparent and open. Wall-mounted displays will be complemented by three-dimensional exhibitions featuring models, materials, and other artifacts. A commissioned video of Dallas’ architectural history is being planned. The glass “drum” surrounding the escalator in the Republic Center lobby is flanked by public seating. In consultation with Aurora, plans are underway for an art installation within the drum, visible from all sections of AD EX. 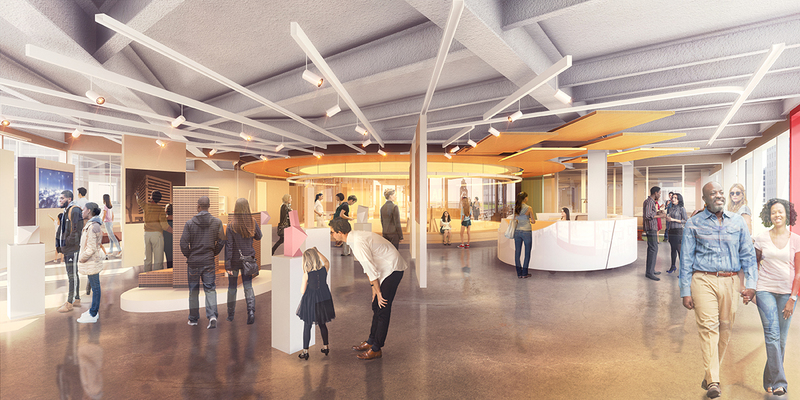 The AD EX reception area will also house Downtown Dallas Inc.’s neighborhood information center, sharing happenings in the neighborhood and beyond. 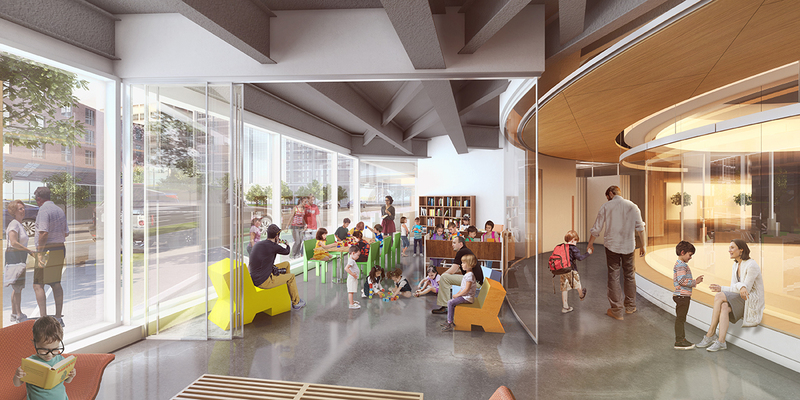 A Design Learning Lab will be the inspiring space for a variety of smaller gatherings, including school groups and workshops, walking tour docent meetings, a resource library, and the opportunity for programming such as book talks and roundtable discussions. As the headquarters for AIA Dallas, AD EX also serves as a work-away-from-work space and gathering area for industry members before their professional development seminars, chapter meetings, happy hours, or other programming. It also provides opportunities for member firms and Dallas architects to showcase their work to the community. Ample, discounted parking will be available throughout the day. Building on the momentum created over the past ten years, we look forward to AD EX becoming a critical force in an ever-growing conversation on the design and livability of our cities. We believe this storefront space in the middle of a new epicenter for downtown will give us opportunities to reach new audiences. Our hope is that AD EX will inspire our community to see its surroundings differently and imagine new possibilities for design as a solution. With our new physical space comes new online spaces as well. Check out the in-process website at DallasADEX.org and our social media presence on Facebook, Twitter, and Instagram. Stay tuned for lots more exciting news between now and our official opening! The AD EX is made possible by our major donors to date, which include HKS, Corgan, GFF, JHP Architecture/Urban Design, JACOBS, Nunzio Marc DeSantis Architects, PAGE, Perkins+Will, and Stantec. The multi-disciplinary design team, selected by the boards of both AIA Dallas and the Architecture and Design Foundation (formerly DCFA), is made up of OMNIPLAN, Perkins+Will (formerly lauckgroup,) Aurora, Better Block, RSM Design, Studio Outside, LUM Lighting Design, and Telios. The contractor is James R. Thompson, Inc.